Enjoy a unique, interactive experience with the amazing art of marbling! We'll help you create a one-of-a-kind hand marbled silk you will LOVE! Use your marbled silk as a scarf or for home décor. You will learn all the tips and tricks you need to know for jaw-dropping results every time! you free to choose your paints and tools. create your one-of-a- kind design. 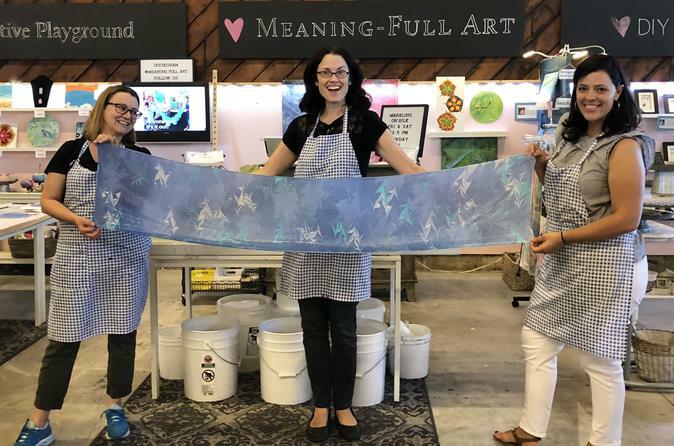 • Lastly, together we will "dip" the 100% Habotai silk into the marbling tray where your design will instantly adhere to the scarf creating your masterpiece! It is a truly a "WOW" moment when your finished scarf is pulled from the marbling tray and held up for all to see! Voila! A wearable work of art! You will receive complete care instruction for your scarf that will include how to dry and iron your scarf as well as washing instructions.